Our bathroom is super tiny, so I don’t post a lot about it. It’s hard to photograph, and it’s the room in the house that changes least often, so there’s not a lot of new things to share about it. but I’ve made some little changes since my last bathroom update post which was like 5 years ago! I took out the old built in medicine cabinet mirror above the sink and put in this round brass mirror from Target. It was only $50 and I love how it instantly elevated the space. We lost a little bit of storage, but honestly that medicine cabinet was so small it was barely worth it. I also added the Pothos hanging plant to the corner (the concrete hanging pot is also a Target find). One of my favorite recent additions is the Moon Phases wall hanging from Vida and Luz! 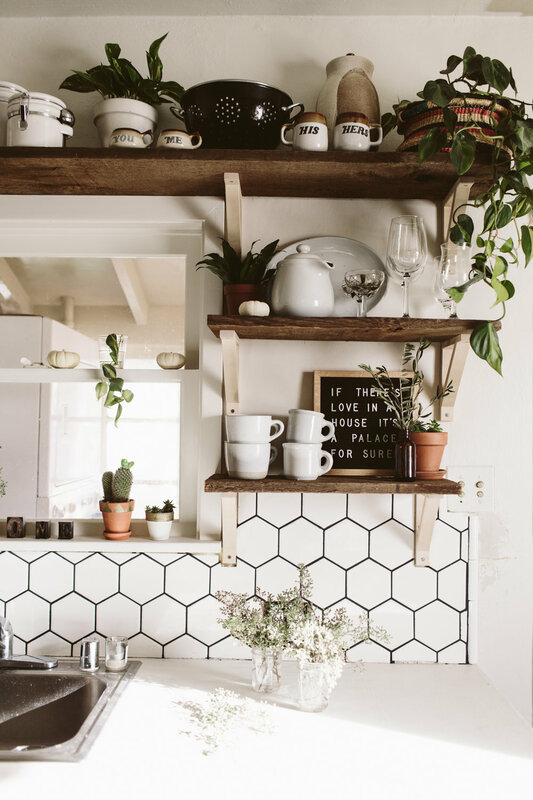 So perfect in here, I love how it looks on the dark wall. I also got the white Mudcloth shower curtain from Target and I love how it adds some interest, but doesn’t make the space feel smaller. 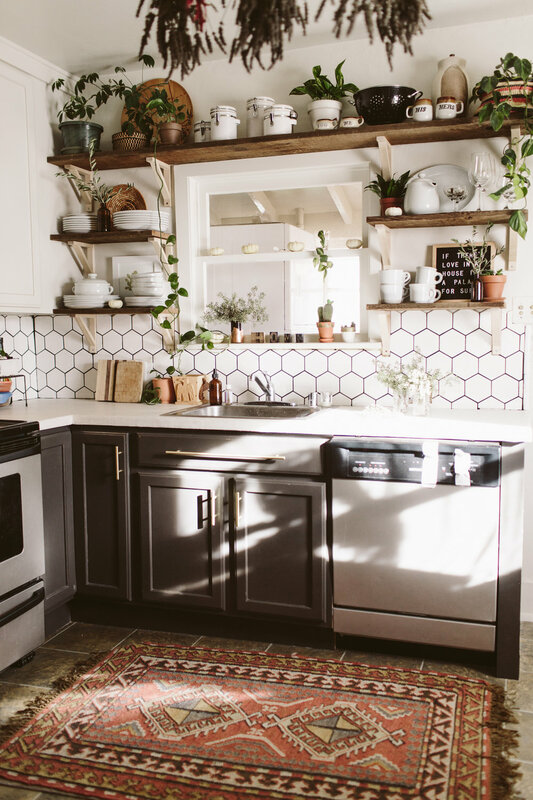 The reclaimed wood hook wall and handpainted herringbone wall are both from my original restyle of this space from when we first moved in, and I still love them both! Thank you Tillamook for sponsoring this post. Try Tillamook Maker’s Reserve! Available at Costco. One of my favorite things about the holidays is all the get-togethers with family and friends… and all the delicious food at said get-togethers. 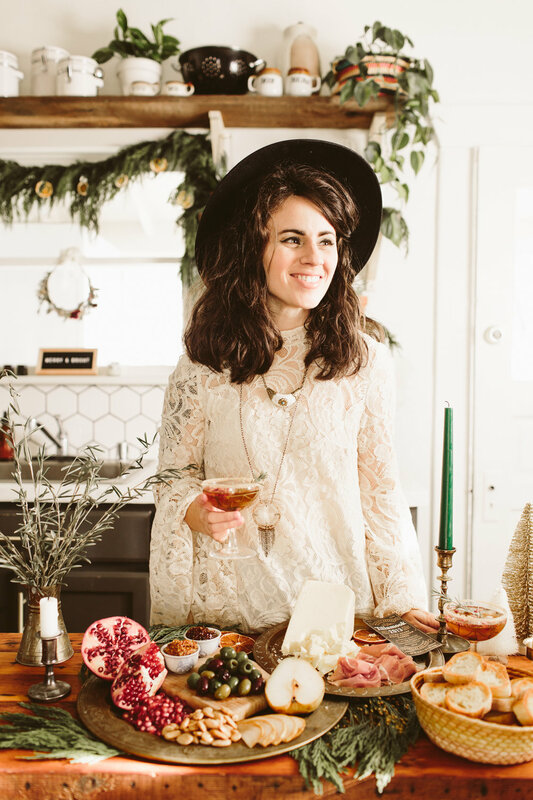 It can feel a little overwhelming to whip something elegant and fancy up, on top of hosting a party, so my favorite thing to do is put together a charcuterie and cheese board. 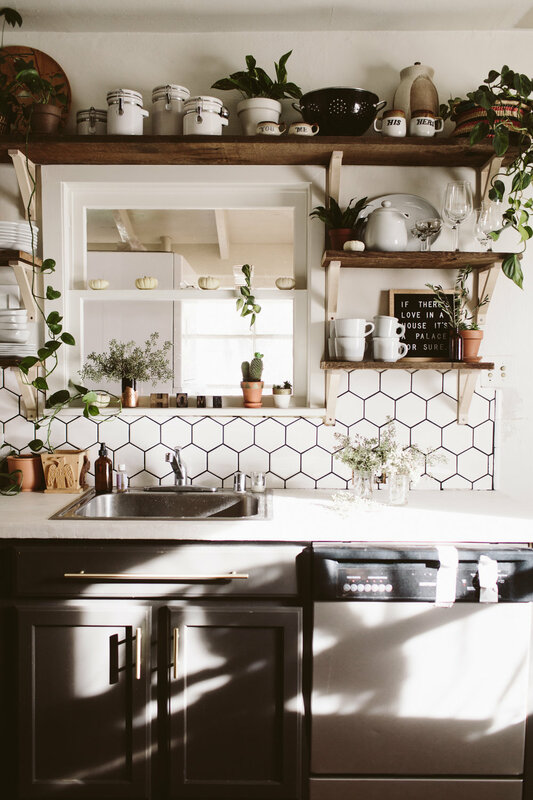 It’s always a crowd pleaser, and you can make it look super lush and inviting without a lot of work! And the best part is you don’t have to cook anything! 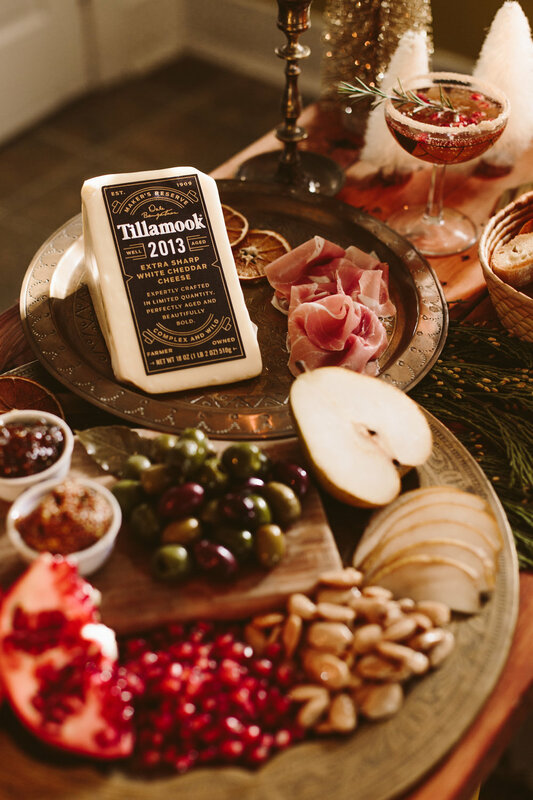 For this spread I partnered with Tillamook to feature their Maker’s Reserve 2013 Vintage White Cheddar. Here in the Northwest we’re pretty big Tillamook eaters, and I’ve actually been to the Tillamook factory in Oregon twice! Watching all those blocks of cheese getting cut and wrapped in the factory is kind of mesmerizing! I’m a fan of sharp cheddars so this cheese hit the spot for me. The Maker’s Reserve line of cheddars are bold with the flavors unique to the year they come from (2013 in this case). If you want to add some to your own holiday charcuterie board, you can find Maker’s Reserve 2013 Vintage White Cheddar (18oz.) 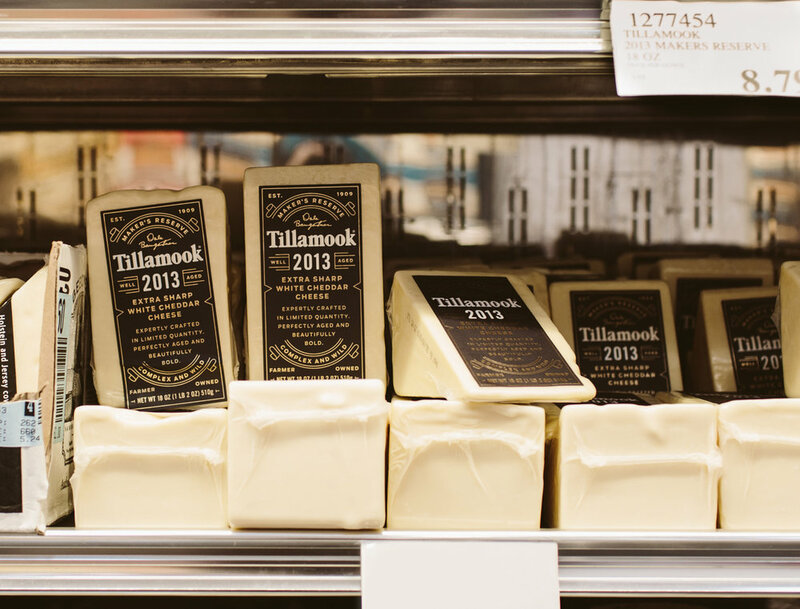 can be found at select Costco stores in the Pacific Northwest and San Francisco Bay Area (search at https://www.tillamook.com/where-to-buy.html to see if your local store has it!). 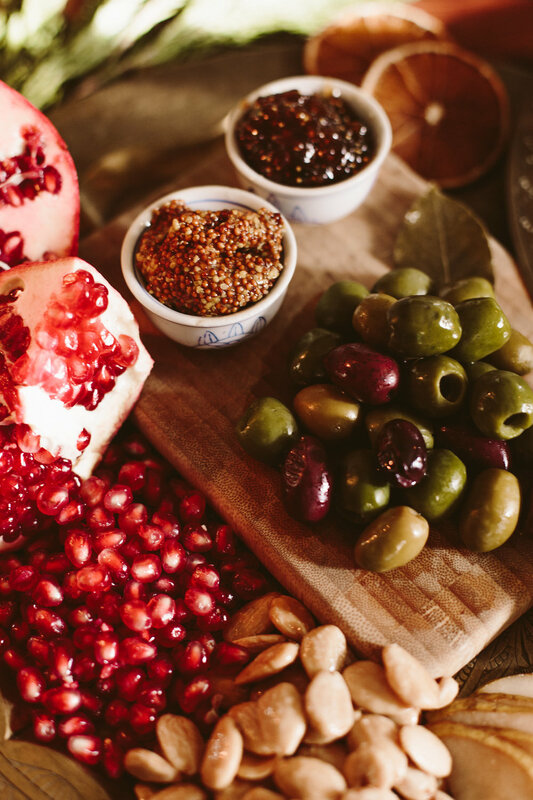 Not sure what to include in your Charcuterie + Cheese board? 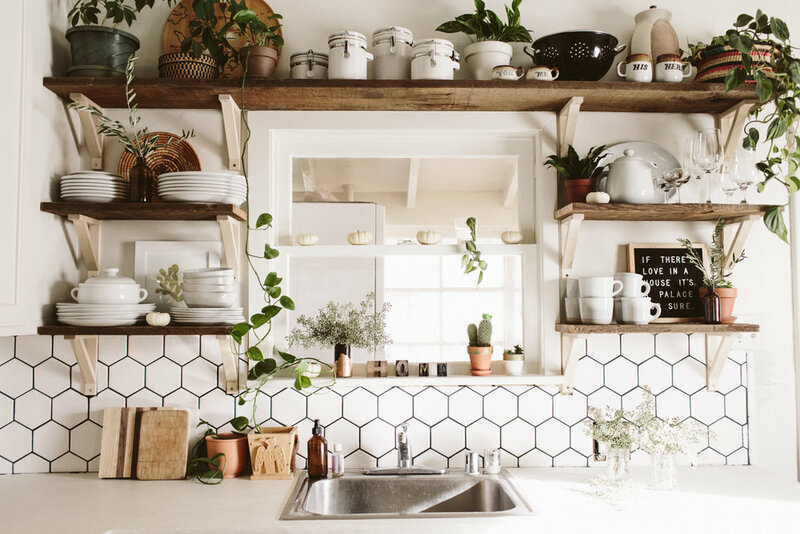 Here’s a list of some of my favorite things to plate up! Rustic Mustard- This is great for spreading on crackers or bread, and is a little fancier looking than your standard mustard. Olives- There are lots of varieties, and some grocery stores even have an olive buffet so you can pick out a bunch of different kinds!! Fruit- Pear slices always make it onto my board, but I also like to pick something seasonal. 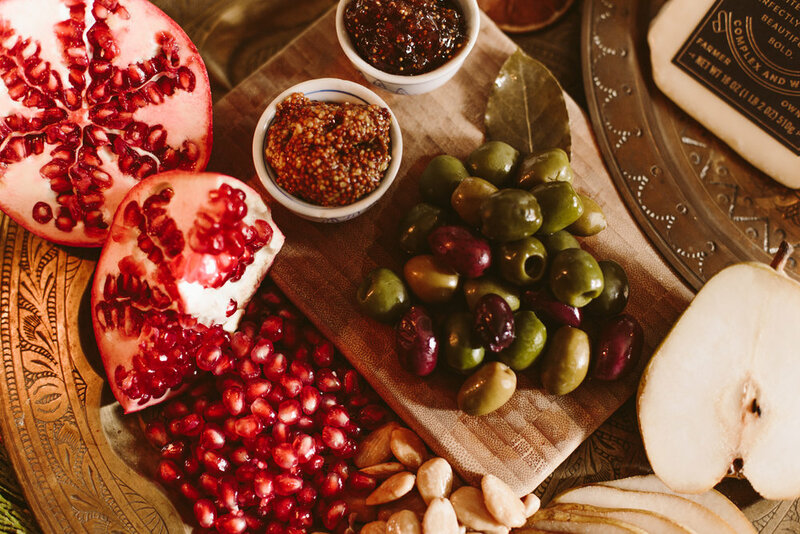 When I saw Pomegranates in my grocery store, I picked one up to include on this board! Sliced bread/crackers- Gotta have a delivery system for all your cheese! I like to pick a rustic bread, slice it up, bake it with a bit of butter spread on each until they’re slightly golden, then cut a garlic clove in half and swipe it on each little toast- it gives them the perfect bit of garlic flavor! Nuts- Marcona Almonds are my favorite to include, but you can choose whatever you like! Specialty or gourmet grocery stores will usually have some fancy nuts to choose from. Now you’re ready to party! 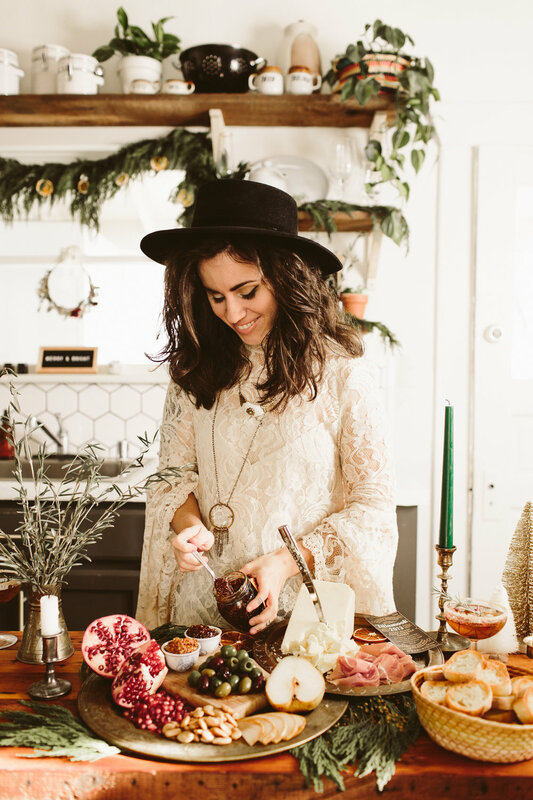 Grab a plate or a big cutting board to arrange all your items on, and your guests will flock to it! Happy holiday partying! I have wanted a white Christmas tree for probably 4 or 5 years. It feels like forever. This year I decided to finally go ahead and just go for it, and I’m SO glad I did. I’m head over heels in love with it. I knew with my black chalkboard wall it would go perfectly, and I’m really happy with how it fits in my space! It’s still early in the season and not even December yet, so I’m sure I’ll make some additions to my holiday decor as we approach Christmas, but I wanted to share my little white tree because I’m so happy with it! I had a ton of fun throwing a “momsgiving” for the group of mom friends I’ve gained this year. I really wanted to celebrate with them all sans kiddos so we could actually hold a conversation, and it was so nice to hang out with adult mamas without our kids for once. My house isn’t big, and it doesn’t have a dining room, so I dragged my low outside dining table into our living room and we all sat on poufs and cushions and snuggled in all cozy like. 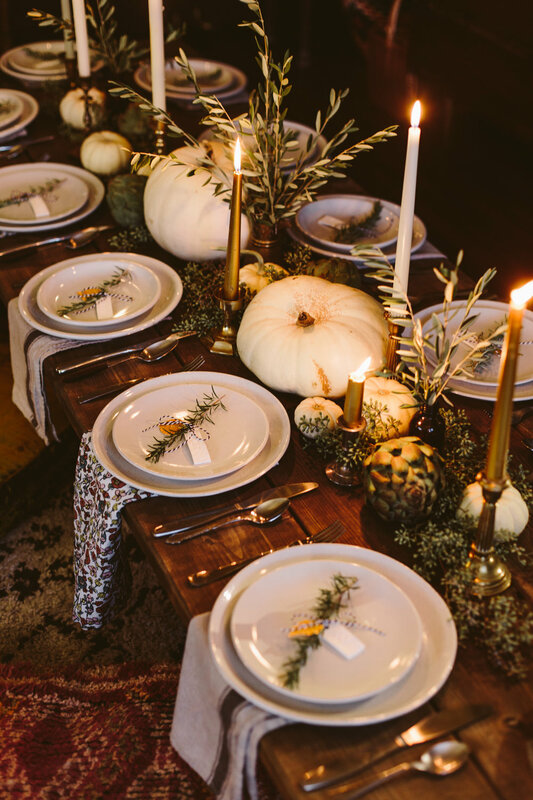 I love putting together beautiful tablescapes, and I wanted to keep this one feeling autumnal without being super colorful, so I went with white ghost pumpkins, seeded eucalyptus, artichokes, and olive branches. I made the place tags with letter stamps and air drying clay, then just tied a sprig of rosemary and a little gold leaf pendant to each one with some bakers twine. All the brass candlesticks and candles were thrifted! sweet pink valentine's day treats!